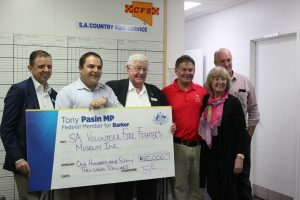 Exciting Funding Boost for the SAVFFM | SA Volunteer Fire Fighters Museum Inc.
At the Annual General Meeting of the SAVFFM held in Naracoorte on November 10th 2018 we were privileged to have the presence of Mr. Tony Pasin MP, Federal Member for Barker. Mr. Pasin has been a long-time supporter of the SAVFFM and at the conclusion of the meeting Mr. Pasin presented the SAVFFM with a cheque for $160,000 from the Federal Government Building Better Regions Fund. This funding, along with some other initiatives that are in the pipeline, should see work commence on the first of the permanent structures at the Naracoorte home of the Statewide museum in the near future. This exciting step forward will allow the SAVFFM to house and display its amassed collection of heritage fire appliances in a purpose-built facility, making them much more accessible to the public.